Okay, so, The Dungeon Zone is an RPG where you play a group of gamers as they sit down to play a dungeon fantasy RPG. It's a weirdly meta, tongue-in-cheek celebration of the most popular tabletop RPG of all time. It uses a simple, quirky Powered by the Apocalypse variant, with so, so many random tables. You can seriously make a whole character with random rolls if you want. In these pages you'll also find appendices lettered A through O, ranging from tables useful for playing the game to random humor stuff awkwardly wedged into the book. There's even a 6-page coloring section for some reason! 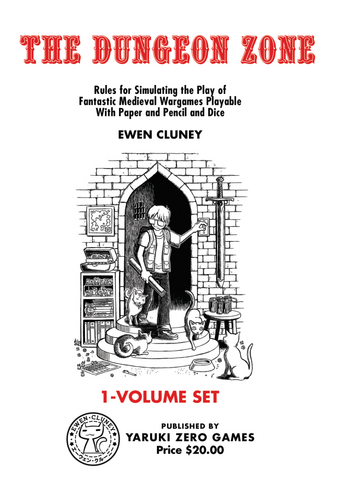 To play you'll need a few friends, printouts of the various sheets, pencils, and some six-sided dice. You can play once in 2-4 hours, or do a longer campaign.